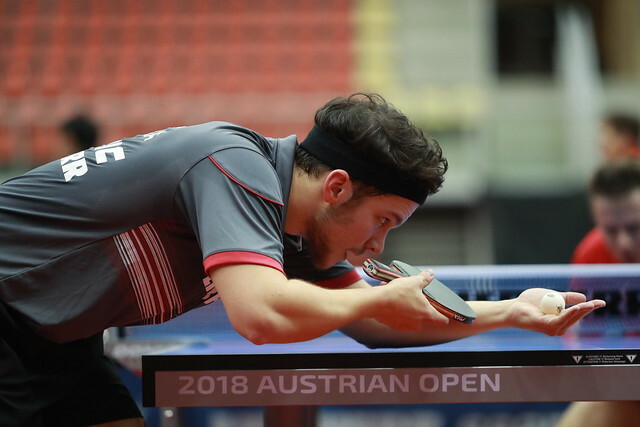 Silver medallist just over six weeks ago at the Liebherr 2018 European Championships in Alicante, once again Ukraine’s Margaryta Pesotska was the player in form as the second preliminary round of the Women’s Singles event, to reserve places in the Seamaster 2018 ITTF World Tour Platinum Liebherr Austrian Open in Linz, came to a close on Wednesday 7th November. Presently listed at no.94 on the Women’s World Ranking, she accounted for Hungary’s Georgina Pota, the owner of the no.33 spot in three straight games (11-9, 11-9, 11-9, 11-9). Defeat for one prominent name contrary to expectations, notably a former ITTF World Tour Women’s Singles winner, having succeeded in Belgium in 2014 and 2016; there was defeat for another, a player with whom Georgina Pota is most familiar, her erstwhile doubles partner, Sweden’s Matilda Ekholm. Occupying the no.64 spot in the current order of merit and also an ITTF World Tour Women’s Singles winner having succeeded in Rabat in 2012, she was beaten by the Czech Republic’s Hana Matelova (11-9, 11-7, 8-11, 11-8, 6-11, 11-9). Currently Hana Matelova is listed at no.64 on the Women’s World Rankings. Surprise outcomes, not for the remaining leading names as the lower half of the draw in the second preliminary round of the Women’s Singles event came to a close. Romania’s Elizabeta Samara beat Poland’s Natalia Partyka (7-11, 11-5, 11-8, 13-11, 11-7); in a rather more tense affair, Canada’s Zhang Mo resisted a spirited recovery by Brazil’s Bruna Takahashi (12-10, 14-12, 12-10, 7-11, 8-11, 6-11, 11-8). Likewise, Chinese Taipei’s Chen Szu-Yu overcame colleague Lin Chia-Hsuan (12-10, 11-8, 11-7, 11-6), Hong Kong’s Lee Ho Ching ended the hopes of Cheng Hsien-Tzu, also from Chinese Taipei (12-10, 16-14, 11-8, 11-5). The third Women’s Singles preliminary round, the round to decide main draw places will be staged later in the day.